OK, I am excited that I want to show it here, but I cut it up to keep out of prying eyes. Yes, what you’re seeing is half a photo of a box that contains a Technic Porsche 991 GT3 RS. This year’s Technic flagship set is the Porsche 991 GT3 RS, in 1:10. 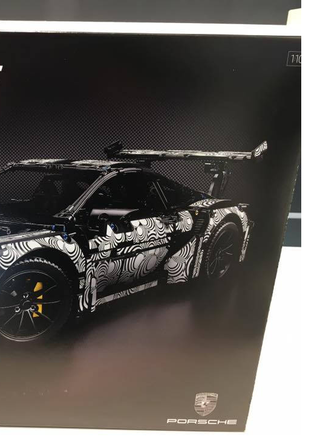 No, the camo is not going to be in the final set, as the actual thing may not even come out in its full glory until the Geneva Auto Show (and I also have a funny feeling that the Hot Wheels version wouldn’t come out until then). You know what else is big, though? Look below. At 3927 pieces, this blocky and drab Bucket Wheel Excavator (42055)is imposing. It’s actually got a small mining truck to take the earth to the next job. Not only is it massive, but it looks like it wouldn’t mind doing some real excavating work. Also present is Claas Xerion 5000 TRAC VC (42054), which is seen here equipped with a logging crane. Check out the tires on that one. Now, let me warn you upfront: those big, impressive sets command a hefty price tag. The Porsche? Upwards of US$300, so better save up.